Interview: Takashi Miike on Blade of the Immortal, Directing 100 Films, and More; New Clips! Yoko Okazaki: Oh no, it's raining. A high school student named Yumi Kamura finds with a group friends in a coffee bar,while her pal Yoko receives a cellular call with a rare tone which she had heard before.Into screen phone appears one missed call.The message is sent for her cellular and contains a horrible shout that sounds like her voice.Besides the call is from three days after.A time later young people receive the call are dead for terrible killing.A strange curse causes a criminal rampage among various adolescents. 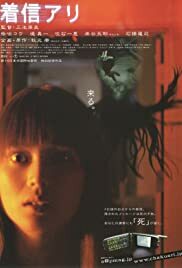 The picture gets suspense,horror,shocks,grisly terror and several eerie scenes.The film displays hair-rising and horrifying images with a bit of blood and graphical gore.Mysterious and sinister atmosphere is well made by the photographer Yamamamoto. Takashi Mike(Ichi the killer) direction sometimes is actually creepy and frightening like proves the first entry ¨Dead or alive¨with the execution starring by a mobster and much more in ¨The audition¨.This horror film is inspired by ¨The ring¨with certain remembrance more even storyline coincidences.Like that and in fact happen in the most part of recently Japan horror cinema deals about an urban legend.It's the initial argument for introducing the terror in the ordinary life by means a phone.While the look is suitable spooky and eerie the plot spread to the breaking point and the final resolution results to be a little confused.The flick will like to Japan modern terror cinema enthusiastic.